We are blessed here in the south west with amazing walking country; from beautiful coastal & estuary walks, wonderful woods, to the wonder that is Dartmoor. From the earliest days of Plymouth IVC, the Sunday walk has been a regular event which is enjoyed by a large proportion of the club. We do not do so much distance walking nowadays, but they do take place regularly throughout the year. 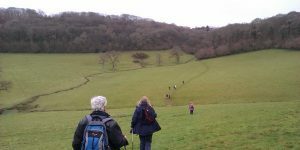 Recent events have included walks around Dartmoor, strollers looking for snowdrops at the Garden House, a number of walks by train, a (very muddy) river walk south of Totnes. Each walk is different and usually starts with an optional meal in a local pub near the start of the walk, although in the summer there is often a picnic instead. If you are interested in joining the club this would be an excellent way of finding out about us!